Angiectasis in a female F344/N rat from a chronic study. 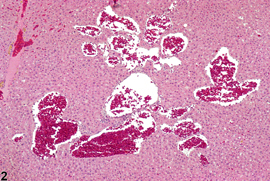 Angiectasis in a female F344/N rat from a diet restriction study. 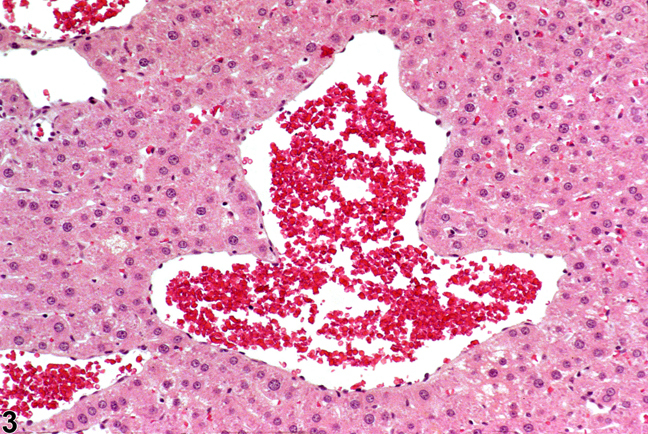 Angiectasis in a female F344/N rat from a diet restriction study (higher magnification of Figure 2). 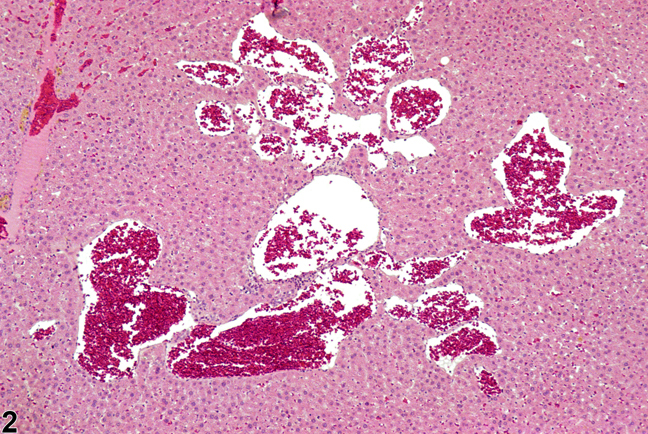 Focal and multifocal angiectasis ( Figure 1 and Figure 2 ) occurs spontaneously, and more frequently as animals age, but it can also be caused by chemicals such as nitrosamines. It consists of dilated sinusoidal spaces that are lined by normal-appearing endothelial cells ( Figure 3 ). In larger dilated spaces, endothelial cells may multiply to line the dilated spaces. 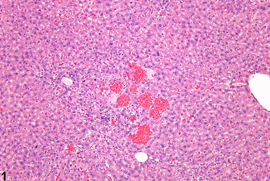 Hepatocytes adjacent to angiectatic spaces may be normal or slightly atrophic. Angiectasis is distinguished from cystic degeneration by the presence of erythrocytes in endothelial-lined channels. 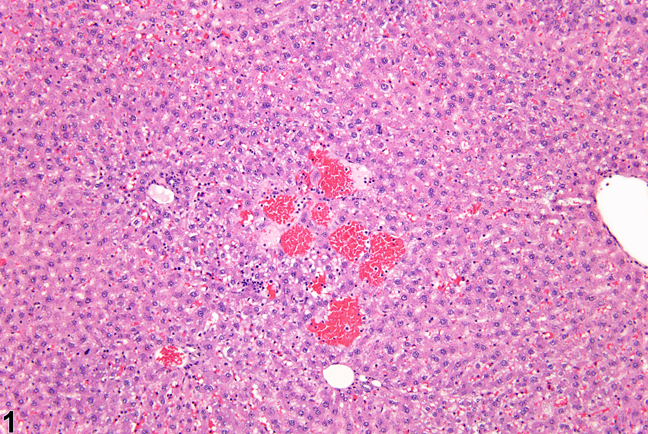 The distinction between marked cases of angiectasis and hemangioma is often unclear. Angiectasis should be documented and graded whenever present as an independent event but should not be diagnosed if it is associated with another lesion, such as a focus or a neoplasm. The number of dilated spaces and their degree of dilation will influence grading. Any indication of treatment-induced angiectasis should be recorded, graded, and described in the pathology narrative. National Toxicology Program. 2010. NTP TR-557. Toxicology and Carcinogenesis Studies of ß-Myrcene (CAS No. 123-35-3) in F344/N Rats and B6C3F1 Mice (Gavage Studies). NTP, Research Triangle Park, NC.